Kim St Jean wants to make sure that you master the basics of metal work. To that end, she does a masterful job in the new Kalmbach Press book, Mixed Metal Mania , showing you in great detail just how to accomplish dozens of basic metal techniques. 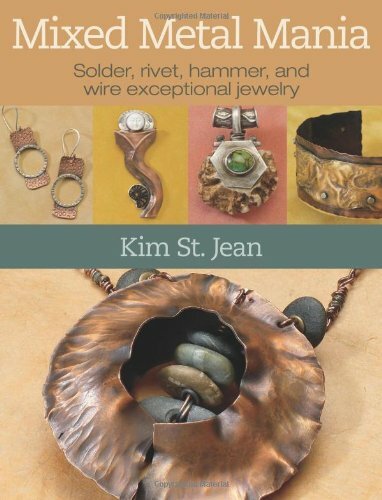 From various cold connections to using flames, foldforming, finishing and everything in between, Kim's book is a resource that anyone working in metal will want to have. Even if you are a complete beginner, Kim makes metal work seem really doable. She has structured the projects in the book to build one after another upon the basics that she teaches. As a popular workshop teacher, Kim knows how to explain and organize. Does metal work seem overwhelming to you? It won't seem quite so daunting once you've taken a stroll through Mixed Metal Mania! What about if you are an experienced metal worker? Kim's personal tips, sprinkled liberally throughout the book, are probably worth the price right there. But add to that some advanced projects that are unique and intriguing...well, you get the idea. I think you'll want this book too. I have to admit that as a tool junkie, I enjoyed the stroll through Kim's studio most of all. And I thought that I had a lot of tools! This looks like a great book, too. I'd just seen another post about this book. I got my Vintage Style Beaded Jewelry book yesterday. It looks wonderful. Thanks so much.